The pretreatment of lignocellulosic biomass is necessary in order to increase the accessibility and solubility of cellulosic components. The aim is to reduce residence time (i.e. reduced capital costs) and enzyme consumption (i.e. reduced operating costs). Moreover, mass losses should be minimised in terms of non-fermentable products and fermentation inhibitors. Steam-explosion is currently considered one of the most effective and least costly physicochemical pretreatments for biomass. 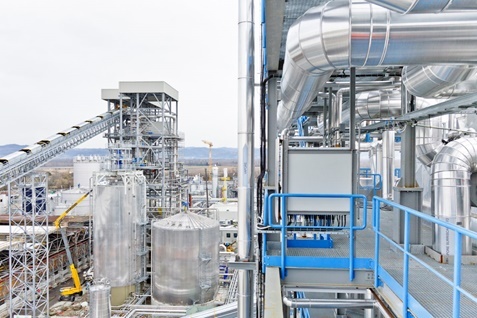 The process uses saturated steam at high pressure to destroy the biomass structure from inside the pores resulting in a physical breakage of the bonds between lignin, cellulose and hemicellulose without the addition of chemicals or high energy input. Biochemtex has developed a continuous process consisting of two treatment steps with different residence time. With this system, biomass is disrupted with the same effectiveness as in the standard steam explosion procedure while steam consumption as well as inhibitor formation is decreased. Within BIOLYFE, this pretreatment was tested with the selected feedstocks and pretreated materials are characterised thoroughly. The final aim was to optimise the pretreatment of selected feedstocks with a view to increasing the efficiency of following processing steps.